Age Limit : Maximum Age 35 Years. Education Qualification : Passed B.Sc Degree in Agriculture/Horticulture/Botany/ Zoology/ Forestry /Microbiology/ Biotech Discipline and Knowledge of Computer Operation. Applicants First Logon to Spices Board Official Website. Open Opportunities link in Notifications Section. 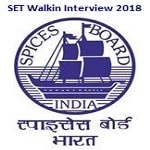 Open Walkin Test for Selection of Spices Extension Trainee Advertisement Link.